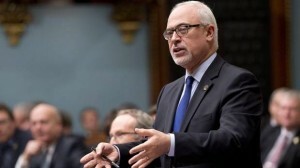 Quebec Finance Minister Carlos Leitao announced Quebec’s budget update today, setting off what is sure to be a continuing series of protests against the cuts, austerity measures and fee increases. The Liberal government claims that this sort of painful pruning is necessary in order to rein in Quebec’s out-of-control finances and balance the budget. The opposition and those affected, of course, will claim otherwise. But, cutting through the slogans and rhetoric, what does this update actually contain? The details are still pending, of course, but at first glance it reads to me as surprisingly… balanced. For one thing, the rich and corporations are being asked to shoulder the lion’s share of the cuts. This is far from a conservative approach. The budget includes such measures as suspended bonuses to senior executives, reduction in tax credits to large corporations, and added taxes on financial institutions, insurance companies and oil companies. Small and medium business, meanwhile, are getting some tax breaks. Even the much-decried increase in daycare fees is largely limited to households making over $75,000 per year, and even that is an increase from $7 to $8. Most families will see an increase of only 30 cents per day, to $7.30. The only families who will pay the $20/day maximum are those with household incomes of $155,000 and above. The current system was very tough on lower income families stuck on long waiting lists — sometimes for years — for a $7/day spot. The updated pricing will be more expensive for wealthier families, to be sure, and might drive more of them to the private system, but this would mean the coveted public system spots will be more available to the people who need them most. Again, hardly Attila the Hun policy. The budget update also contains a number of environmental measures, including registration fee increases for large vehicles, insurance fee premium increases for drivers, added taxes on fuel at the pump, and several green energy and anti-climate change initiatives. Yes, the general population will shoulder some of the burden, too. The most contentious austerity measures aim to trim back public sector pensions, which arguably needs to be done, but the government’s heavy-handed approach here is backfiring. Someone who has worked in a public sector job for their entire career on the promise of a certain pension should not be told, now that they’re close to retirement, that they won’t be getting what was promised. There simply isn’t enough time for them to go back in time and save more money. In addition, the MNAs had to be shamed into scaling back their own ridiculous pensions — something that should’ve been a no-brainer in “austerity” times. They did it, but kicking and screaming. However, on the whole, the private sector can’t afford to indefinitely shoulder the burden of such high public pensions, especially when the taxpayers supporting them largely have no pensions and insufficient retirement savings themselves. To make matters worse, the government has picked a fight with unions by reducing the tax credits for union dues. This will cost union members a mere $70 or $80 each on average per year, but the unions are powerful foes and are already angry about Bill 3. The last election saw many unionists break with the PQ in anger over Pierre-Karl Peladeau, the Charter of Values and a whole host of other things. But the unions and the PQ are traditional allies, and the small amount of savings that the Liberals will get from this tax credit scaleback (estimated at about $112 million per year) probably isn’t worth the political cost of driving them back together. On the whole, this budget update reads refreshingly Liberal by Canadian standards, though perhaps not by Quebec ones. It’s not a Tory reward-the-rich-and-oil-companies-at-the-expense-of-everyone-else budget. But the actual provisions may end up mattering very little when compared to the visceral opposition to the A-word: Austerity. A lot of people are angry. The Liberals have little choice but to do their deepest cutting early on in their mandate, hoping that by the time the next election rolls around in four years, there will be enough of a recovery to shower the population with pre-election gifts. But in the meantime, it may not be pretty.